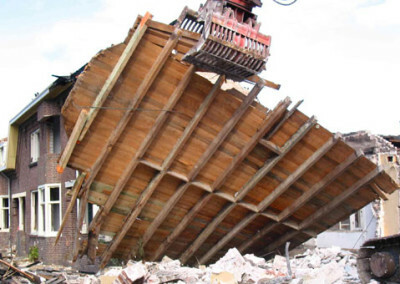 The worker’s neighborhood Vissershop had to be razed because it was continuously sinking. I received the commission to guide this change. The residents placed their stories and memories in a treasure chest. 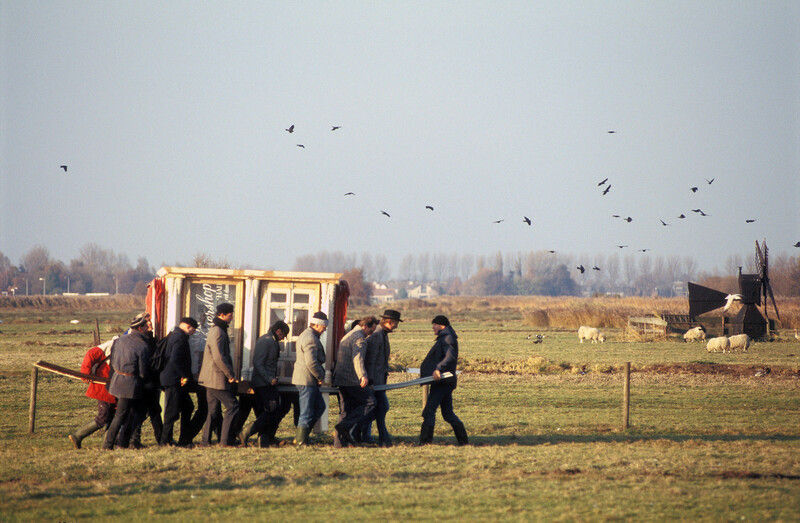 It was brought to the Zaans Museum in a procession. The memories were worked out in the stripped homes. The best memories were engraved into one hundred natural stone sidewalk tiles and now lie in the streets. 2003 – Farewell to the old Vissershop – I constructed the treasure chest out of characteristic scrap material. The columns from Notenlaan, a barbershop window, bird houses, and windmill sails formed a poetic summary of Vissershop. The Hoppers deposited their memories of the neighborhood in the treasure chest. 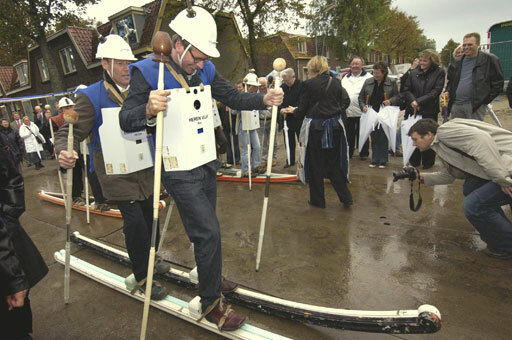 On November 8, 2003, they carried it with their own hands to the Zaans Museum. 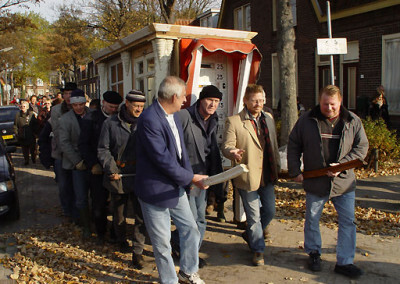 First a procession through the neighborhood followed by a boot trip on the Zaan River. This developed into a special day which people would talk about for a long time to come. The treasure chest stood in the Zaans Museum until 2015. 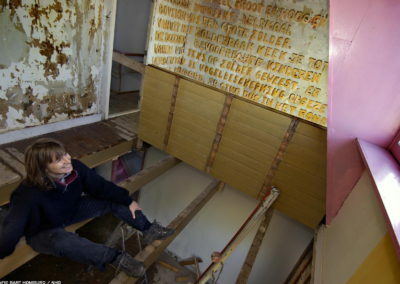 It is now owned by the housing cooperative ZVH. 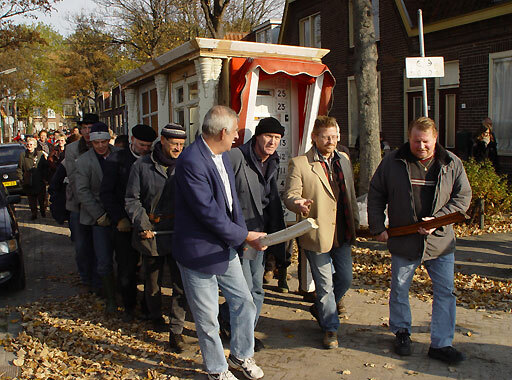 2004 – Moving the soul – The housing cooperative ZVH was enthusiastic about the farewell ritual. They also wanted to have an opening ritual for the delivery of the new homes. I symbolically moved the soul of the old Vissershop to the new construction. 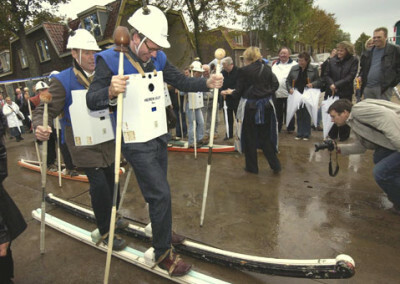 Three teams, the builders, the residents and the housing cooperative, wore costumes made of water heater housings and helmets made of water faucets and doorknobs. 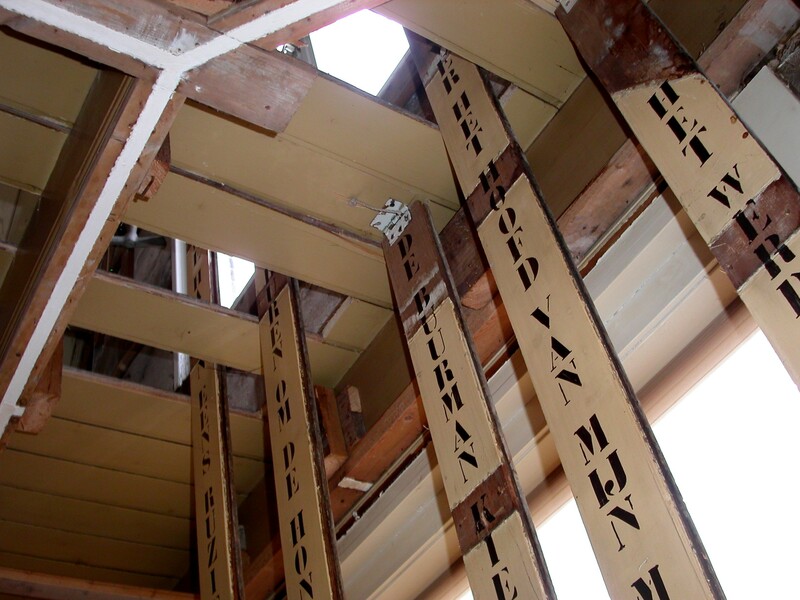 The teams collected stories, read them out loud and brought them to the new homes on skis made of stair railings. 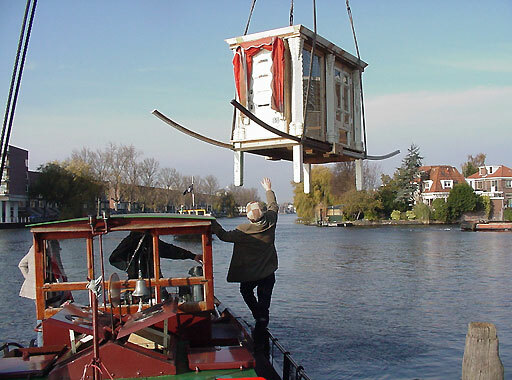 The moving of the soul was an extra commission form the housing cooperative ZVH. 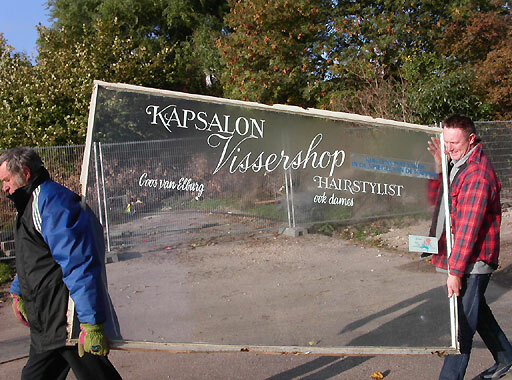 2004 – Telling stories to the world in the razed homes – The stories in the treasure chest formed a wonderful image of old Vissershop and her residents. They were rebels, stubborn and proud. 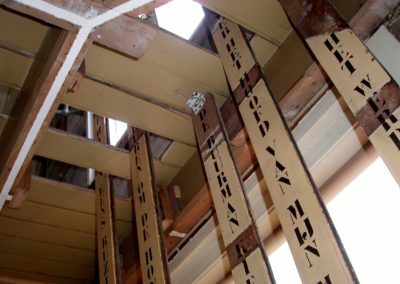 Residents, artists and volunteers worked out the stories into a spatial story book in the partially razed houses. The residents came several times to have a good look at the stories, but also to meet old acquaintances. The stories which expressed the essence of the Hop finally received a place in the streets of the new Hop. One hundred natural stone tiles 60 x 60 cm in size were laid in 2006.
Financing Gemeente Zaanstad, Groot Steden Beleid, Provincie Noord Holland: Actie Plan Cultuur Bereik en Beeldende Kunst. Concept and production Ida van der Lee In opdracht van Gemeente Zaanstad i.s.m. 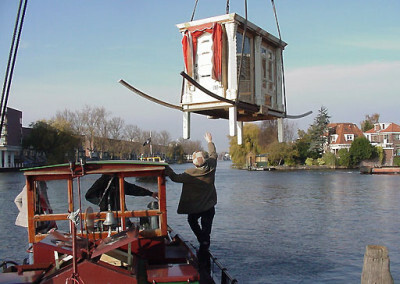 de Adviescommissie Beeldende Kunst Zaanstad, Jacqueline Kostermans. Treasure chest bearers Ben, Paul, Aad, Fred, Rob, Benno, Theo, Wim, Carst, Ton, Mario, Jaap, Piet. Graphic design Philip Stroomberg, Marja Hoekstra, Arnold Weel. Cooperation resident’s commission of Vissershop, Dura Vermeer, Heren 5 Architecten, Kristal, Pronklust, Stichting Welsaen, Woningcorporatie ZVH, Zaans Museum. Technical design Jaap Velserboer, Natasja van Eijk, Jonas Snijder, Mark Flapper. Technical production Sjoerd Sporken, Dieudonné, Erwin Lemmen, Stefan Kok, Maaike Matu. Sponsors Crane company: Johan Schol. Tugboats: T. Koenen, H. Duis en M. Mol, G. Kreuning, G. Klop, T. v.d. Markt. Fireboat: Harbor service. 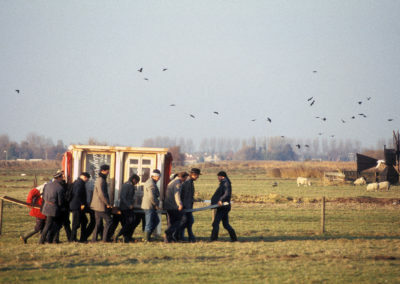 Barge: W. de Jong en P. de Goede. Trailor: Herman Schoehuys. Volunteers Michiel, Jolanda, Fred , Jan, Marianne, Henk, Hellen s, Jaap, Jolanda, Carlos, Femmy, Rob, the Merkx family.